Elegantly proportioned over-upholstered wingback chairs, each featuring out-curved arm supports. The seat is raised on a newly refinished ebonized fruitwood base. Measures: Seat height 16". Quality rattan armchair in the manner of Gio Ponti, Tito Agnoli or Lio Carminati. Curved and contoured back for ultimate comfort, circa 1950-1960. A pair of wingback lounge chairs Newly re upholstered with ivory mohair velvet (Nobilis). Elegant chairs in the style of Gio Ponti or Paolo Buffa Italy, 1950s. 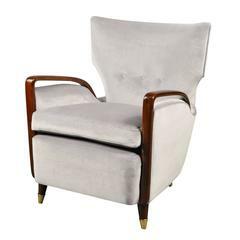 Chic 1950s American wingback armchair with apricot velvet. Great original condition. Measure: 21.25" seat width. 21" seat depth. 18.25" arm height.